FILE - In this Feb. 15, 2015, file photo, the Space Needle towers in the background beyond a container ship anchored in Elliott Bay near downtown Seattle. China has attacked U.S. President Donald Trump's threat to halt trade with any country doing business with North Korea after its latest nuclear test, saying it endangered vast trade relations between Washington and Beijing. 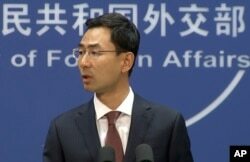 Foreign ministry spokesman Geng Shuang said Monday, “What is definitely unacceptable to us is that on the one hand we work so hard to peacefully resolve this issue [of North Korea's nuclear weapons development], but on the other hand our own interests are subject to sanctions and jeopardized. This is neither objective nor fair." A man watches a TV news report about a possible nuclear test conducted by North Korea at the Seoul Railway station in Seoul, South Korea, Sept. 3, 2017. After Pyongyang detonated its biggest nuclear bomb in an underground test Sunday, Trump said he was considering several options in response, including cutting off trade with countries that do business with North Korea. That could quickly hinder the nearly $650 billion in annual trade between the United States and China, the world's two biggest economies, because Beijing is North Korea's sole major ally and its biggest trading partner. Whether Trump plans to carry out his economic threat is unclear as the United States and its allies press the U.N. Security Council to take new action against Pyongyang. United Nations U.S. Ambassador Nikki Haley addresses a U.N. Security Council meeting on North Korea, Sept. 4, 2017 at U.N. headquarters. 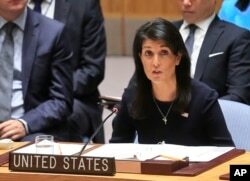 Nikki Haley, the American ambassador to the U.N., told the council Monday, "The time has come to exhaust all of our diplomatic means before it's too late. We must now adopt the strongest possible measures." Geng declined to say what measures Beijing might support against Pyongyang, saying it would depend on discussions among council members. He said China, as one of five permanent Security Council members with power to veto U.N. actions, would participate in a "responsible and constructive way." FILE - In this image made from video, Chinese Foreign Ministry spokesperson Geng Shuang speaks during a press briefing in Beijing, July 11, 2017. Geng also voiced frustration at Australian Prime Minister Malcolm Turnbull’s remark that Beijing had a responsibility to influence North Korea because it is North Korea’s main trading partner. 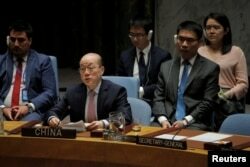 At the United Nations, Chinese Ambassador Liu Jieyi urged North Korea to "stop taking actions that are wrong." 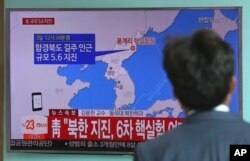 Beijing said North Korea is "deteriorating the situation and not in line with its own interests either." He said Pyongyang should "truly return to the track of resolving the issue through dialogue." FILE - China's Ambassador to the United Nations Liu Jieyi delivers remarks during a meeting of the U.N. Security Council on North Korea at U.N. headquarters in New York City, Aug. 29, 2017. Liu said all parties should "seriously consider" Beijing's proposal for a joint suspension of Pyongyang's ballistic missile and nuclear programs and military drills by the United States and South Korea. The United States has rejected an end to the military exercises.